A week-long celebration and education campaign from Vegan Society of P.E.A.C.E. In 2006, our organization created the Texas Veggin'-out Days campaign to support our vegan & vegetarian establishments in Texas and to bring recognition to World Vegetarian Day (October 1) and World Farm Animals Day (October 2). Our campaign was recognized by the North American Vegetarian Society (NAVS) in 2007, when we were awarded "Most Notable Outreach by a Group". It has also been supported statewide by the member groups of the Lone Star Vegetarian Network (LSVN). 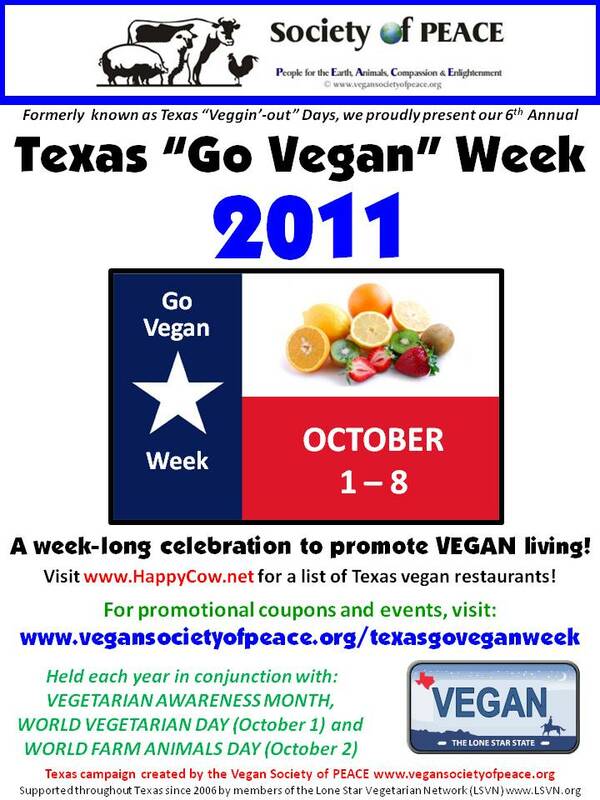 In 2011, our campaign expanded to a week-long celebration and education campaign promoting vegan living called "TEXAS GO VEGAN WEEK". Our campaign kicks-off the start of Vegetarian Awareness Month and runs from October 1-8, 2011. Last year, participating vendors offered some great incentive discounts to those who used our coupons! 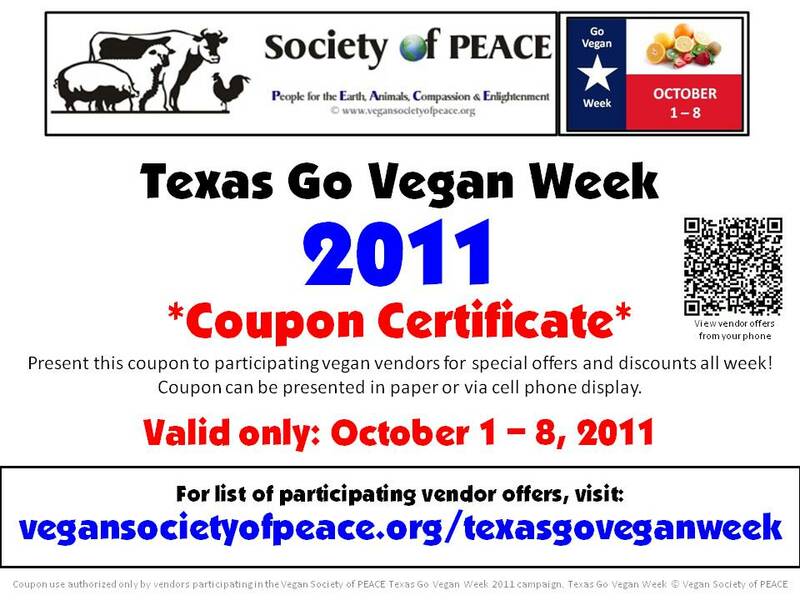 This year, you'll only need to download and print one coupon (or show your phone display) to receive special discounts from participating vendors during "TEXAS GO VEGAN WEEK" 2011. Click HERE to view 2011 participating offers from vegan vendors and restaurants. Click HERE if viewing from a smartphone or to download and print your 2011 Coupon Certificate. Scan this code to use the coupon on your smartphone.